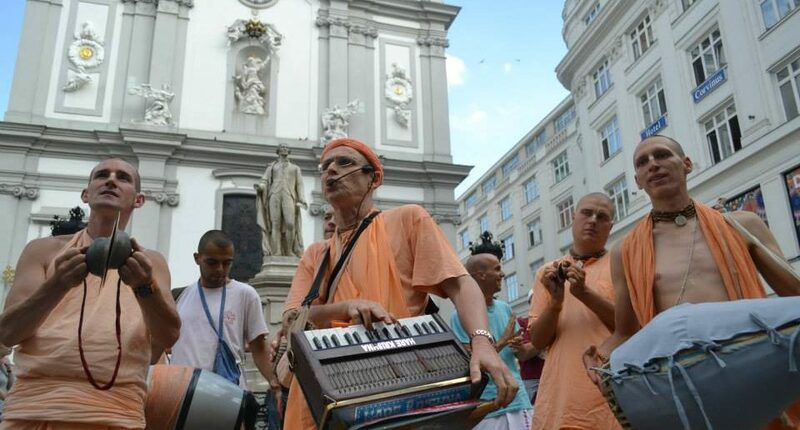 From the kirtan festival in Villa Vrindavana, Italy, Kadamba Kanana Swami travelled to Vienna on 14 July. 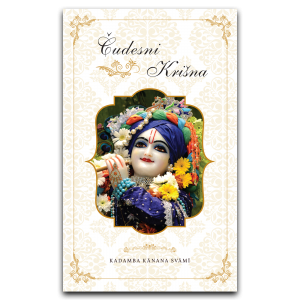 Paramesvar picked him up from the airport and brought him to the new temple near Bratislava where the temple room was packed with disciples and eager guests – some of them were from the Czech Republic, Austria and Hungary. 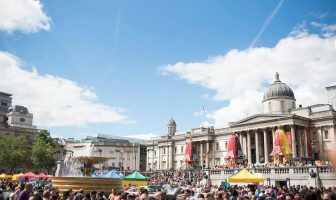 Devotees were anticipating beautiful bhajan which quickly turned into wild kirtan, followed by a deep thoughtful lecture. 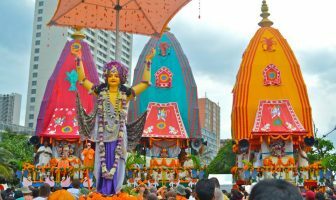 While Guru Maharaj was being fetched from the airport, Jahnavi and Kristina were trying to string together the most beautiful garland, but the roses were so big that even the biggest needle in the house would not go through. 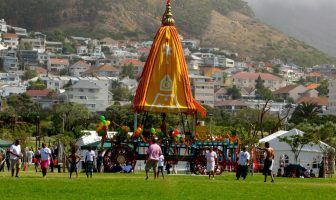 However, with the expert help of Mukunda Prabhu, the garland was successfully completed. 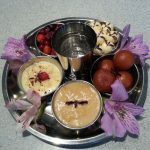 The lecture started with the theme of corruption and the strong influence of the age of kali, and continued with explaining the secret gift of the maha mantra – the rest you can hear by yourself (recordings to follow shortly). After the program at Bhaktiloka, Guru Maharaj went to Modra to rest and prepare for another active preaching day. 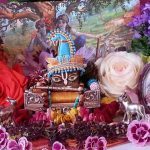 In the morning, after abhisek, puja and breath-taking decoration of Giriraja’s altar, Guru Maharaj took his simple breakfast consisting of avocado, dates and bananas. Yogesvar and I cooked lunch for him, which included his favourites: chapattis and endive. Jahnavi and Mukunda offered the most delicious sandesh ever, made from the milk from one of the twelve cows they so exemplary take care of. 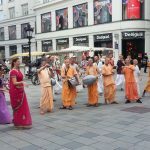 The next point on the agenda that afternoon was harinama and a lecture in Vienna. 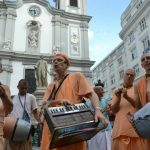 The Harinama Ruci kirtan party could not miss the Vienna harinama and along with other devotees, they expertly enlivened the city and gave support to Guru Maharaj. 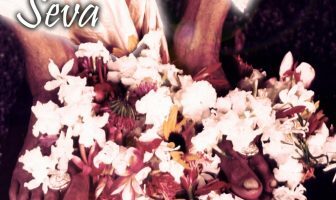 Then we proceeded towards the Ananya Yoga Studio and its name inspired Guru Maharaj to speak about ananya bhakti, pure bhakti. 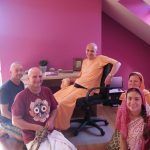 Thursday was a darshan and resting day, and many fortunate disciples including Jada Bharata, Kristina, Pato, Paramesvar, Mukunda, Jahnavi, Marcel, Ada and Yamunacarya had the chance to personally speak to Guru Maharaj. 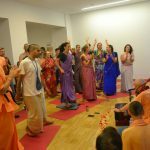 On Friday before noon, Maharaj sang bhajans in our temple room and afterwards, we packed and set-off for a ride to Prague for a stopover. 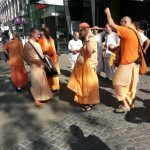 On Saturday (18 July), Maharaj travelled to Munich for Ratha Yatra and then returned to Prague for Ratha Yatra which took place on Sunday. 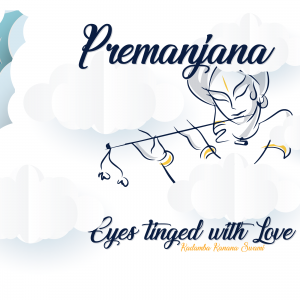 During our drive, Maharaj entertained us by reading his horoscope which was indeed full of beautiful qualities, yogas, constellations and descriptions. Again, it was an amazing time with Guru Maharaj and we all are looking forward to have him back next year. All of you are welcome to come as well! Visit flickr to see more photos.